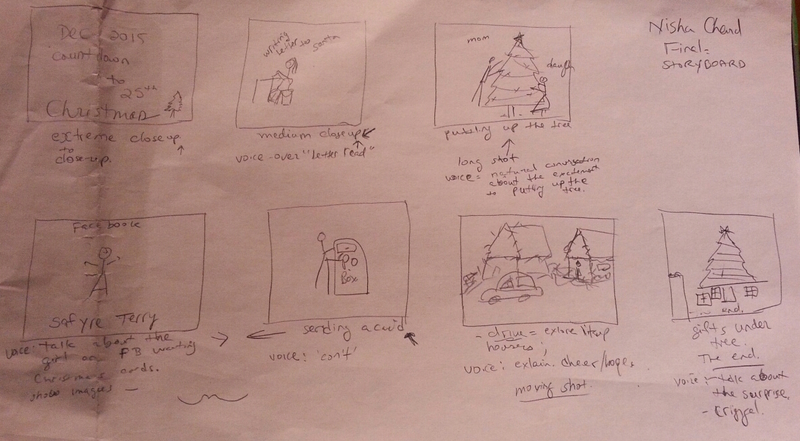 My final film will be based on Christmas. It will be an abstract form of of a documentary. For every Christmas, we take out time to decorate our homes. The lights make the environment so much more cheerful. We write to Santa Clause in hopes that we have been good enough all year to earn presents from Santa. We leave cookies and milk to allow Santa enjoy his visit to our homes. I am not Christian or Catholic, etc, but I envision Christmas as a wonderful turn of events and a fabulous way to end a year. No matter how much strife, turmoil, sadness, anger, busy, or down one feels, the environment of the Christmas cheer brings hope and bliss. The holiday events, the holiday cheers, the holiday gatherings, the wishes, all these little activities bring so much happiness that the sorrow can be forgotten. It’s a great time in the year for those who are lucky. So in my film, I hope to bring some cheer into life. I hope to show the efforts put in to decorating a tree. I want to take a minute and observe this young girl that came across my FaceBook. Her name is Safyre Terry – She is a survivor of a Arsen Fire that killed her parents. Her wish this year is to receive Christmas Cards from around the world. I will also send one. I will capture this special moment this way. I hope to show many decorated houses on a road trip while I talk about it cheer they bring to me. In the end, I’ll show us with some gifts under the tree. Because at the end, that’s what it’s all about for a child. The gifts. But for me, it’s about opening the gift of hope into a new year. Me, my daughter, family, The Decorated Homes, and Safyre Terry on Facebook and other media. Also, Santa Clause (in conversation only). I had taken time out to actually watch this documentary. This documentary makes me think about how real this situation may be. Why wouldn’t anyone want humanity to survive and be rid of such a disease like cancer? After watching this, I am influenced to think that the FDA and AMA are all about pharmaceuticals based capital gains. The well being of a human life has no place or value in a profitable business. It’s a wonder why none of the natural ‘ayurvedic’ remedies are endorsed by the FDA. This documentary made me feel sad for the victims of cancer, and irritated on their behalf. I felt a lot of animosity growing against AMA for taking so much control over the medical industry, and therefore our lives. It seems true, and I wonder about the truth in the cure that Renee Cassie found. The treatment she gave was named the reverse of her last name, as Eissac. 1938, she received 55,000 signatures for her petition to legalize her cure, which was rejected by the legislation. The legislation claimed that the the patients were mistakenly diagnosed, and that the diagnosis were only legally allowed by doctors. Her clinic did not survive for long afterwards. She had the proof and the patients to back her, but still the legislation did not permit her to use her remedy to cure patients. FDA did not approve her remedy. In fact, the authorities attempted to get her arrested for trying to treat patients without authority. In fact, in some states it was established that it will be a felony for any doctor to prescribe their patients Eissac. Similarly, Harold Hoxey, N.D., founder of the Hoxey clinic, also put up a fight to legalize natural remedies discovered in the treatment of cancer. He was arrested many times for trying to treat and for fighting for his belief. To disseminate his theory, he even made a movie in 1957, called “You Don’t Have To Die”. In fears that the Hoxey treatment was becoming of demand over the solutions FDA approved and offered in hospitals, the medical authorities produced a public warning notice cautioning public from using the Hoxey treatment. Furthermore, they closed down his 17 clinics. Hoxey finally gave up his fight after 25 years and opened a new clinic in Mexico, and is still successful. December 6, 2015 marked a life event for both my daughter and myself. Her father, my ex-husband, had a son – with his wife, my daughter’s step-mother. Perhaps prior to this date, there was always some jealousy in me as to why another woman can be titled mother of my daughter – even if it’s step. This date did change how I felt to an extent. I now wish with envy that my daughter’s step mother’s son, my daughter’s half brother, could have been able to address me with the same respect. Yet I am a no body to him. I am only the mother of his half sister. How unfair. While I was thinking of several documentary choices in the recent past; I dropped all those thoughts and options. My ex and his wife just had a son on December 6 at 10:52 AM at Winthrop University Hospital. My ex relayed the news to me while he was away at work – yet to return home. I took our daughter to the hospital for my daughter to see her new step baby-brother. I couldn’t think of a better documentary at this point. Such a little baby and how everyone, from my point of view, gets around me and is around the baby. I could get my daughter’s feelings, the baby’s parents feelings, grandparent’s feelings, and more. Most importantly, I can share my feelings as the mother of the daughter who now has a step-brother. So, I’m hoping I can do justice to the truth and to their visual display of affection. I am moved. I was compelled. I can share that emotion as the compelling factor in my documentary. Have you ever wondered why one packet of sugar is not enough for your tea or coffee? Or have you ever brewed tea/coffee in your house and when you add sugar for two people, why two or even three spoons of sugar are not enough? Well — lately I have realized that the sugar spoon in my house has grown into a a 4 oz cup. It hadn’t occurred to me that there is more to it than what sees the eye. I love sweets. They are my only weakness that keeps me preventing from loosing excess fat. It’s that simple. Thus today, after class – I was thinking that if I had to watch a documentary – I should watch something that will educate me in a personal way and maybe curve my attraction to all of the sweet stuff out there I love to indulge. Chocolate being first my love and enemy is the reason I decided to watch about sugar. So via this documentary I learned that we eat tons of sugar in a day without even realizing we eat sugar! I mean TONS of sugar! The Food industry, in an attempt to attract customers, pay a high price to find the perfect taste where sugar is just right for the majority. 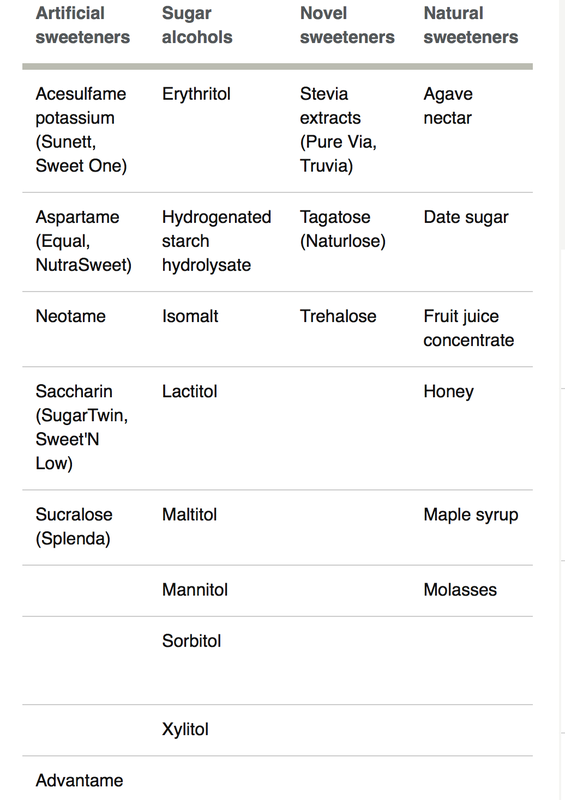 Below is a list of additional sweeteners found listed in ingredients. The majority of the population consumes, unknowingly, approximately 26 spoons of sugar in the various forms in an entire day – that is approximately 4000 grams or 40 kg per year! Common brands, like below, can’t even survive in the food industry if the taste was not a primary factor – and this taste is what we, the consumer, determines. 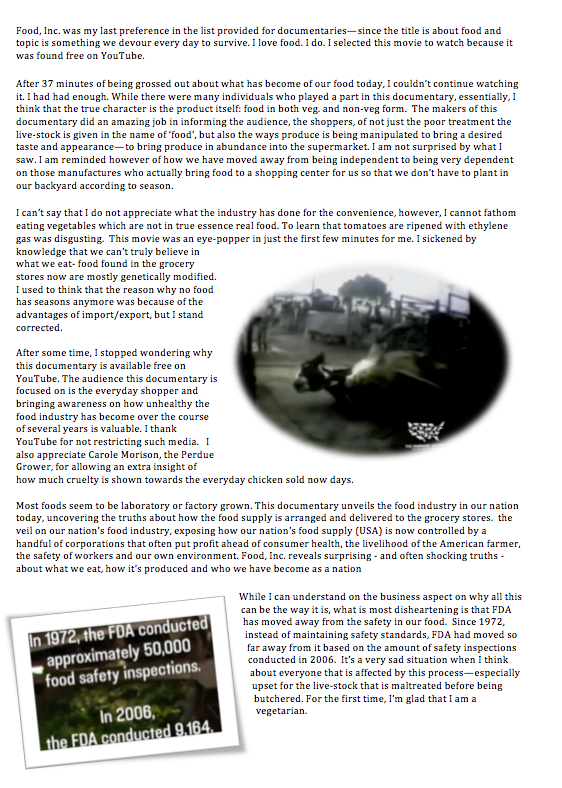 Bruce Bradley, former Food Industry Executive, confirms that without sugar or supplements, no food industry can survive. In accordance to Dr. Howard Markowitz, a.k.a. Dr. Bliss, sugar drives taste in edible products and the competition remains success due to the perfect amount of sugar in demand. It’s apparent that since we eat sugar all day long, we do become somewhat immune to it’s flavor and over a period have grown accustomed to sugar in our daily routine. Sugar breaks down into two simpler sugars: Fructose and Glucose. Glucose is something found in all cells and is produced by humans when not consumed. It spreads out through the body feeding muscles and brain. Fructose, on the other hand, is not needed nor produced in great quantity by the human body. Additionally, fructose is only broken down in the liver. For people who are inactive and eat a Western diet, large amounts of fructose from added sugars get turned into fat in the liver. And it is in the liver that all kinds of metabolic diseases begin. I am moved by this knowledge. I have to watch what I eat and improve on how I can eat better.